News | Southern Marches Area Quaker Meeting. We have added a link to the Quaker Blog to our Menu and to our Useful Links page. The Blog is written by a variety of Ffriends on an incredible range of subjects – it is worth subscribing to the Blog to get the new posts delivered directly to your inbox. Recent blog posts have covered the INF treaty collapse, Sanctuary Meetings and, of course Brexit. Of particular interest following Peter Hussey’s reports on two conferences he attended is this post about Diversity and Inclusion. This entry was posted in News on April 7, 2019 by smaqmadmin. From Charlotte Lake, Area Meeting Children and Young People’s Advocate. Theme: Quakers in the 21st century – What will our chapter be? This entry was posted in News on March 18, 2019 by smaqmadmin. You can download a PDF version for display in your Meeting House. This entry was posted in News on March 3, 2019 by smaqmadmin. 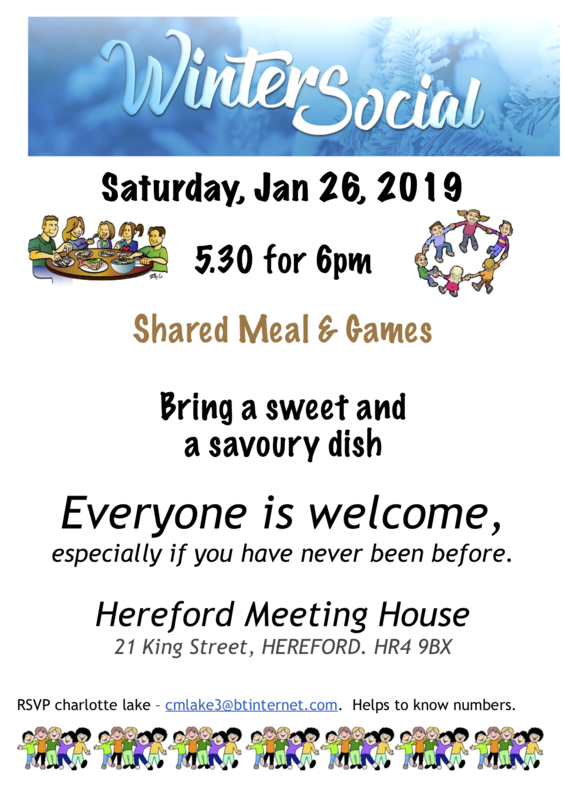 Meeting of Friends in Wales – 23rd February 2019. 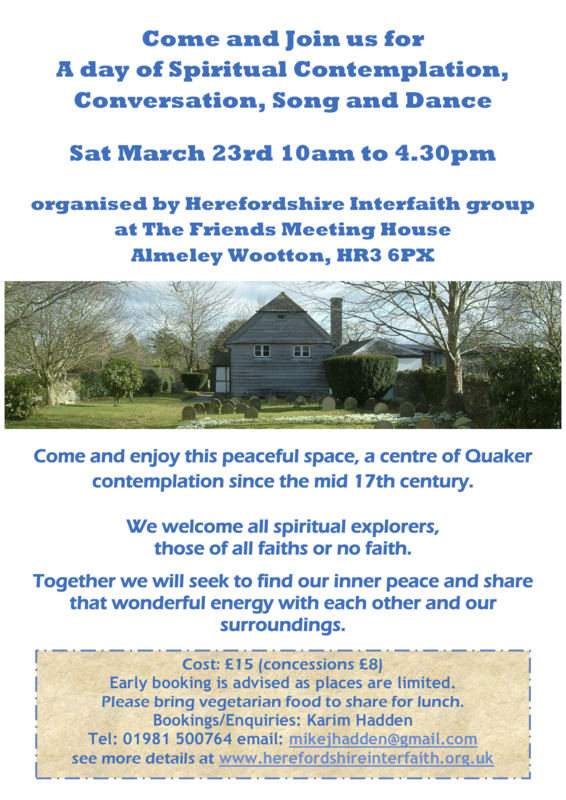 The focus of the Meeting will be the revision of Quaker Faith and Practice. 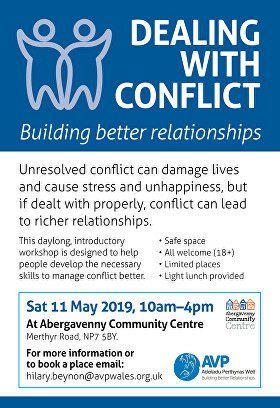 Area Meeting in Brecon – 9th March 2019 at the Subud Hall, Brecon – a map with directions can be downloaded – please click here. The Pales Spring Newsletter 2019 is now available – please click here. 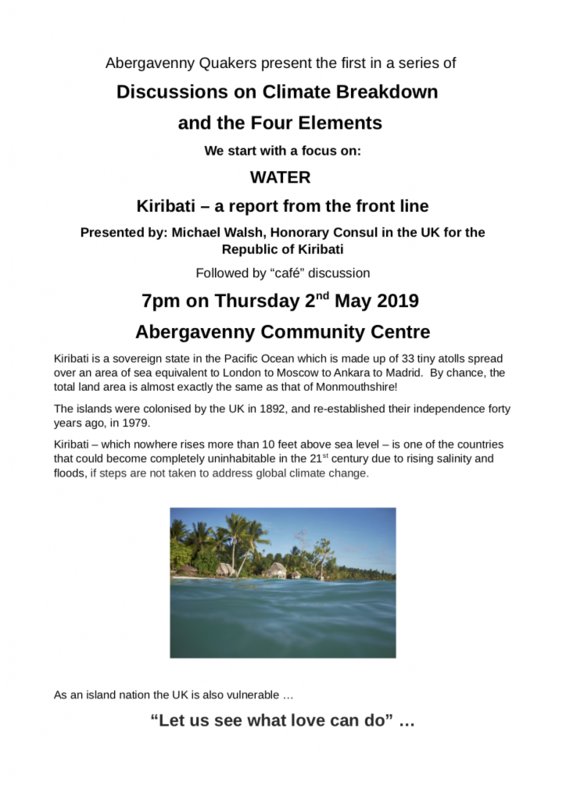 Yearly Meeting 2019 – 24–27 May at Friends House, London. Ffriends attending BYM might like to know that there is a Youth Hostel opposite St Pancras Station, quite close to Friends House. There are 6 bed dormitories, male and female at very reasonable prices. At Yearly Meeting 2019 we will examine our privilege (and assumptions of privilege). Privilege – whether we recognise it or not – fundamentally impacts our ability to act on our urgent Quaker concerns regarding climate justice and sustainability, and inclusion and diversity. This entry was posted in News on February 14, 2019 by smaqmadmin. You can download and print the poster – please click here. This entry was posted in News on January 11, 2019 by smaqmadmin. Green Christian have a really helpful leaflet called ‘Nine ways to live gently’. It’s an excellent way of sharing a range of positive tips on how to reduce our contribution to climate change. Here is a summary of these lifestyle tips. How many are you following? Get to know your MP, write letters, sign an online petition, go on a protest. Seek out like-minded people in your local area or online, to encourage one another. Simplify your life; be liberated by needing less. Re-invent second hand goods from charity shops, improvise, make things, swap clothes! Dig the earth, grow herbs on your window sill, save and cherish water, take an interest in wildflowers, bees, butterflies, fish, birds and rocks, include the Earth in all Church liturgies, plant trees for special occasions such as baptisms or weddings. Use Locally produced, Organically grown, Animal friendly and Fairly traded British fruit and veg in season. Support local shops and grow some of your own food. Eat less meat and dairy foods. Walk, cycle, take the bus, tram or train, if possible, and use local shops, notice the beauty on your doorstep, organise lift shares. If you must fly, offset. Get in touch with the seasons, seek out local adventures, enjoy the journey and limit your driving. Change your electricity provider or campaign for your university, council or church to disinvest, insulate your home, wear an extra layer, turn the thermostat down, if buying new appliances go for AAA rated, if possible generate your own electricity. This entry was posted in News on January 5, 2019 by ludloweditor.